Welcome to Aquaponics! No matter if you are just searching for a way to become a little more healthy or if you are a practiced hand at traditional soil gardening — you will find a great environment here to learn about this thing called Aquaponics. In brief, Aquaponics is the combination of Aquaculture (raising fish) and Gardening (raising plants), now there are some differences: We do not use Soil in our garden beds (called grow-beds) and we also use absolutely NO CHEMICALS OF ANY TYPE!!!!! Want to know more? Well here at Green Phoenix Farms, our goal is to provide you with the knowledge and skills necessary to enter the hobby with confidence and ease. Our workshops are perfect for individuals of any background or skill level. For 2014, we will be offering our classes in a back-to-back format over a two day period. You are welcome to sign up for a single class if that is all you need, or if you want to do more – you can register for the whole weekend. So, if you have thought that Aquaponics might be something that you would like to try, but didn’t know where to start this is a great time for you to begin. 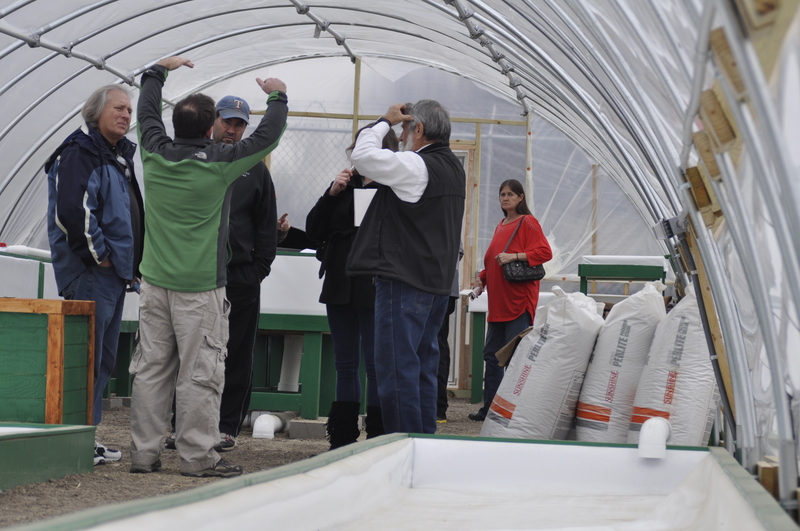 Even if you know a little about Aquaponics, these workshops will give you a much greater grasp on system mechanics and the capabilities of the same. Each individual Seminar/Workshop comes with a Printed Manual and our 100% Money Back Promise. If you are not completely satisfied with your experience, we will refund your money in full. Please review the descriptions below and we hope to see you all at the Workshops!Simply put, this is YOUR learning experience — come to the sessions that YOU want to. AP101: An Introduction to Aquaponics: In this seminar, will have four (4) hours of instruction, where we will cover everything that you need to know to go home to operate your own Aquaponic system. The 25 page manual for this session covers the following information in detail: System Options and Configurations; Types of Aquaponic Systems; Physical Components and Equipment; Living Components – Plants and Animals; How to Cycle Your System; Ongoing Maintenance; and Basic Troubleshooting. Plants: Seed Starting in Aquaponics: This two (2) hour class will cover the basics of how to grow plants efficiently and productively in Aquaponic systems. We will identify and discuss a number of reputable sources for high quality heirloom seed. As a part of this discussion, we will cover a number of the common methods for sprouting seeds, focusing on those that work particularly well for Aquaponics. Propagation through cuttings and cloning will be covered and we will learn how to prepare our own rooting hormone extract to assist with this process. For seed Saving, the class will discuss the appropriate techniques for collecting high quality seed, cleaning the collected material and finally how to store seeds to ensure future germination is . Participants will receive a sample of heirloom seeds! Filtration Methods: This two (2) hour class will explain the operation and construction of two mechanical filtration device designs. These filters can dramatically increase the fish capacity of an aquaponic system by removing the solid waste. In this class, you will not only learn theory, but you will build two different types of mechanical filters. Siphons and More: This three (3) hour class will explain the operation and construction of four different non-powered methods to drain water out of your grow bed. Specifically, we will review the theory behind “automatic” siphon types and we will discuss specific differences and components of different designs. In the warehouse workshop, the class will be able to observe the operation of each type. Finally, members of the class will will have the opportunity to practice assembly of several difference styles of “Automatic” Bell Siphons – specifically the “Classic” Bell Siphon, the “Affnan” Siphon and the newer “Torcellini” Bell Siphon.